1. Which of these best describe weathering? 3. What is the most important agent of chemical weathering on Earth? 5. Which common minerals when they weather tend to break down and convert to clays? 6. Which of these common minerals is most weathering resistant on the Earth's surface? 7. When granite is weathered, what happens to most quartz? a. It is broken down to form clay minerals. b. It is broken down to oxide minerals. c. It remain virtually unchanged, becoming mostly gravel, sand, and silt. d. It dissolves and becomes part of seawater. 8. When granite is weathered, what happens to most feldspar? a. It is mostly broken down to form clay minerals. b. It is broken down to form oxide minerals. c. It completely dissolves and becomes part of seawater. d. It remain virtually unchanged, becoming gravel, sand, and silt. 9. What is the origin of the abundance of rounded boulders of granite in arid regions such as in mountainous landscapes in southern California? a. Groundwater seeps into fractures in the granite, causing chemical weathering along the margins sharp edges and corners along the fractures. b. Durable granite cores of blocks of unfractured granite tend to escape weathering longer. c. As erosion strips away the saprolite (weathered granite), the hard rounded cores of blocks of granite accumulate on the surface. d. All the choices are correct. 10. What is the layer of weathered rock and mineral fragments located between the bedrock and the surface in most places? 12. Which of the following is included as a component of soil? 13. 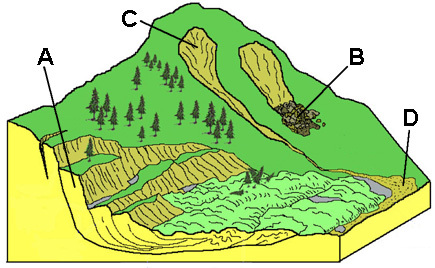 Which of these are the zone of accumulation in a typical soil profile? Question 14 applies to the diagram below. 14. What forces and processes are responsible for the features illustrated on the diagram? 15. What is the name of a landslide that occurs in volcanic regions that can result in a debris flow or debris flood containing volcanic material that can travel long distances downstream?